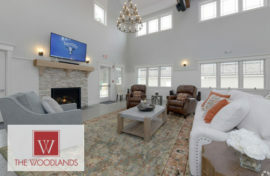 Braintree and Middleboro, MA (March 28, 2018) – Peabody Properties today announced the Grand Opening of the 6,000 square foot entertainment clubhouse at The Woodlands in Middleboro offering a game lounge, movie theatre, surround sound TV, billiards, golf simulation and multi-function catering kitchen. The Woodlands is also pre-leasing for Phase ll with construction to be completed in late spring of this year. The luxury apartment community offers residents thirty-four scenic acres that include walking trails and cranberry bogs. Along with the clubhouse they offer a high-impact fitness center, business center with Wi-Fi, indoor kid’s corner and outdoor playground for children, multi-purpose sport court, pool, grilling station and fire pit, bike storage, car wash stations, elective car charging stations, fenced pet park and washing zone, and easy access to I-95, I-495, routes 44 and 18 and commuter rail transportation. “We are proud to provide a community that offers all the comfort of living and special amenities for our residents to enjoy and make them feel at home,” said Balvinder Sahni, CEO of Cranberry Management LLC. Peabody Properties, Inc. is Marketing and Management Agent for The Woodlands. The one, two and three bedroom open concept apartment homes offer high end finishes, such as plank flooring throughout, gourmet kitchens and in-home washer and dryers. The apartment homes will be both market rate, with some homes designated as affordable. Peabody Properties’ Powdermill Village Honored as a 2017 Community of Quality® Award Winner by NAHMAReading’s Peter Sanborn Place Is Always Up For Shenanigans!